Los Angeles may have a reputation as a concrete jungle, but in reality, it's full of amazing wildlife. You just need to know where to find it! 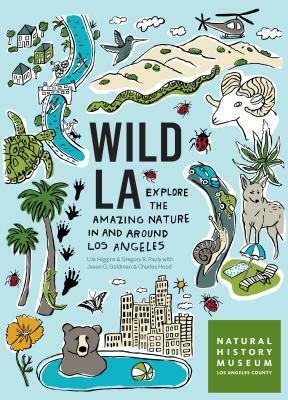 Equal parts natural history, field guide, and trip planner, Wild LA has something for everyone. It looks at the factors that shape local nature—including fire, floods, and climate—and profiles over 100 local species, from easy-to-spot squirrels and praying mantids to more elusive green sea turtles, bighorn sheep, and mountain lions. Also included are descriptions of day trips that help you explore natural wonders on hiking trails, in public parks, and in your own backyard. The Natural History Museums of Los Angeles County include the Natural History Museum in Exposition Park (NHM), the La Brea Tar Pits in mid-Wilshire/Hancock Park, and the William S. Hart Museum in Newhall. They operate under the collective vision to inspire wonder, discovery, and responsibility for our natural and cultural worlds. The museums hold one of the world’s most extensive and valuable collections of natural and cultural history—more than 35 million objects. Using these collections for groundbreaking scientific and historic research, the museums also incorporate them into on- and offsite nature and culture exploration in L.A. neighborhoods, and in a slate of community science programs. This creates a new natural history museum experience that explores the past, but increasingly addresses the present and the future. Lila M. Higgins grew up on a farm in the United Kingdom, where she had lots of time for unstructured play in the wild. Her love for nature, especially insects, grew out of this time and lead her to study entomology and environmental education. Her work at Mass Audubon Society’s Drumlin Farms sanctuary and at the Mary Vagle Nature Center focused on connecting people to nature, particularly in urban settings. Currently she oversees NHMLA’s community science program and loves getting people involved in studying the plants and animals that live in Los Angeles. Dr. Gregory B. Pauly is curator of herpetology and co-director of the Urban Nature Research Center at NHMLA. His research since joining the Museum in 2012 has focused on the impacts of urbanization on wildlife. He is an advocate for community science and believes partnerships between professional scientists and community members can revolutionize scientific research. His fieldwork has involved studying frogs in tropical rainforests, lizards in the Mojave Desert, and introduced geckos across Southern California neighborhoods. He has authored or coauthored numerous scientific publications, including several with community scientist coauthors. Dr. Jason G. Goldman is an award-winning science journalist, expedition leader, and public speaker. His writing has appeared in Scientific American, National Geographic, Los Angeles Magazine, The Washington Post, BBC Earth, Audubon and elsewhere. He’s the director and co-founder of SciCommCamp, a camp-style retreat that brings scientists and science communicators together to inspire fresh, exciting ways to tell compelling science stories. As a founding member of the Nerd Brigade, he works to democratize access to and promote literacy in science, technology, engineering, and mathematics. Charles Hood grew up in Atwater beside the Los Angeles River. He has been a bird guide in Africa, a translator in New Guinea, and a National Science Foundation Artist-in-Residence in Antarctica. He is the author of many books and essays including A Californian’s Guide to the Birds among Us. Three of his books have won national poetry awards; he also curates art exhibitions and is a Research Fellow with the Center for Art + Environment at the Nevada Museum of Art. A reformed birder, he stopped counting at 5,000 species, but he admits he’s recently started a world mammal list.